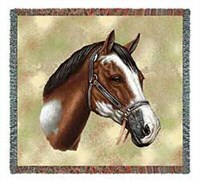 Order Horse Design Throw Blankets online in a variety of styles. Cozy up with a beautiful, woven throw blanket! This all-season throw blanket is designed for curling up on the couch with a cup of hot cocoa or relaxing on a summer evening with a cool glass of lemonade. Made with PURE-tech wicking technology, our poly/cotton blend blanket allows for eco-friendly, rapid drying, reduced static, and a longer life. This blanket will add a unique and stylish touch to your home décor with your favorite patterns or designs and can also be custom-made with your family photo memories for grandparents, moms, and dads! Dimensions: 54" x 38". Sure footed on the trail and ready to go the distance, this intelligent Appaloosa will give you a ride home to relaxing comfort. 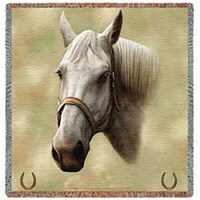 Our soft Appaloosa Horse Blanket boasts a beautifully detailed equine portrait with the look of a fine woven tapestry. Durable, long lasting and versatile, just like the noble Appaloosa, this Throw makes a stunning addition to couch, bed or wall. True heirloom quality art in 100% cotton, our Appaloosa Blanket makes couches cozier and beds whinny with style. This 54 x 54 inch Appaloosa Horse Lap Square warms knees and feet with free spirit and distinctive flair. This popular beauty of legend and myth gallops into your life with a hint of exotic Arabian nights swirling around his flowing mane and mesmerizing eyes. Our Arabian Horse Blanket makes any room special with its stunning artistic style and detail. Woven with soft 100% cotton thread, this decorative Arabian Blanket promises sweet dreams as you snuggle comfortably on the sofa by a roaring fire. Our Arabian Horse Lap Square measures approximately 54 x 54 inches. Welcomed into the American colonies in 1725, the noble Arabian pictured on this Throw makes the perfect addition to your home corral. This fun and whimsical design features a pattern of standing horses in bright colors such as pink, purple, lavender, blue, and shades of green. This pretty girly pattern has horses wearing blankets and long manes that is great for anyone who loves ponies and is an equestrian! This colorful coral pink and mint or teal green classic equestrian design features a patterned horse theme. Two different graphics of a galloping horse in light grey. Perfect for the horse or pony lover's home decor! A great gift for your horse trainer or barn manager too! A cozy throw blanket for accenting your country home. Reversible: leopard print on one side, solid brown on other. Plush micro fiber construction. A classy western throw by Carstens! This cozy micro fiber throw blanket boasts a leopard print design on one side & a solid brown hue on the other. Blanket stitched accents. Measures 54" x 68". Imported. Drape yourself in western John Wayne throw blanket! Plush micro fleece keeps you nice & toasty! Image of John Wayne on horseback in hues of red, brown orange & yellow. Signature featured at front of throw. Blanket measures 48" x 60". John Wayne fans will adore this classically western blanket! Add our John Wayne throw blanket to your collection. Snuggle up with our super soft fleece throw. Image of John Wayne on a horse. Blanket is made of 100% polyester. Imported. Add western comfort to your home with a cowboy design throw blanket. A family of horses in a field pasture. Multi-colored design works with many color palettes! Proudly made in the U.S.A.. A quality tapestry throw blanket for your western lifestyle! Add a western touch to your home decor. Mid-size throw blanket measures 60" x 50". Made of 100% cotton. Add western comfort to your home with a cowboy design throw blanket. Colorful hues of yellow, blue, red, green, black & white create western design throughout. Proudly made in the U.S.A.. A quality tapestry throw blanket for your western lifestyle! Add a western touch to your home decor. Mid-size throw blanket measures 60" x 50". Made of 100% cotton. Add western comfort to your home with this throw blanket. Colorful hues of yellow, blue, red, green, black & white create western horse design throughout. Proudly made in the U.S.A.. A quality tapestry throw blanket for your western lifestyle! Add a western touch to your home decor. Mid-size throw blanket measures 60" x 50". Made of 100% cotton. Accent your sofa or cozy chair with our Western Way tapestry throw.. Constructed of quality fabric. Front features hues of white, blue, tan, brown & black to create image of running horses & cowboy hat & saddle. Sides feature black & white fabric fringe; top & bottom have multi-colored fringe. Matching pillow available. This throw will kick up your western motif a notch! 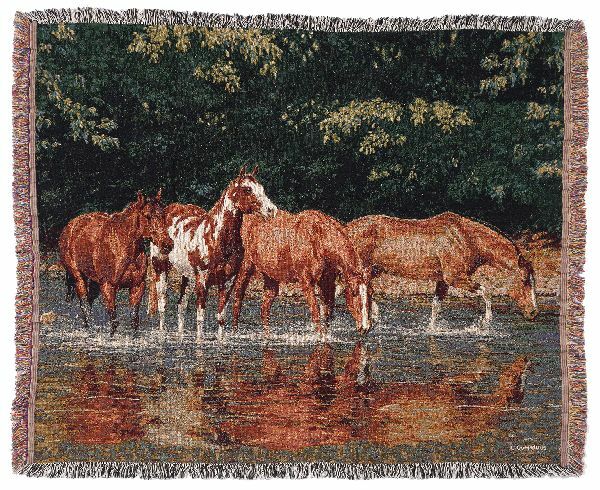 Our Western Way tapestry throw features a bold running horses and cowboy hat design on the front. Throw measures 50" x 60". Made of 100% cotton. Nicker, neigh or snort with delight! Our stunning Paint Horse Blanket adds unique, spotted splendor to your home or office decor. Crafted with the colorful detail of a fine tapestry, this 100% cotton Paint Horse Lap Square makes every Horse lover's heart race with excitement. The spotted beauty on our 54 x 54 inch Paint Horse Blanket looks picture perfect on sofa, bed or wall. Snuggle in and whinny in style. If you're a singing cowboy (or cowgirl), you'll remember "Old Paint's a good pony" and he'll love nuzzling while you nap under this Throw. Great gift for horse lovers! Sneak quietly into your covered wagon and cuddle up in this soft and cozy Palomino Horse Blanket. 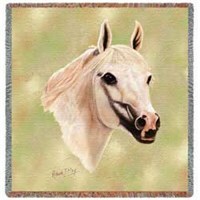 Woven with 100% cotton thread, this durable Palomino Horse Lap Square makes any room come alive with Palomino pleasure. Whether you're a breeder, horse lover or Roy Rogers fan, this heirloom quality Palomino Blanket will cover you with memorable nickers and nuzzles. Our versatile 54 x 54 inch Throw offers every admiring friend a chance to snuggle in the saddle while visiting your home corral. Two of the most famous show biz Palominos? Trigger and Mr. Ed, of course. Whoa, Nelly! 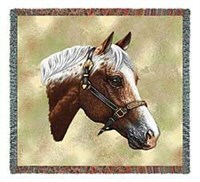 This beautiful Quarter Horse Blanket rides your bunkhouse bed or couch in artistic style and flair. Woven in 100% cotton comfort, our cozy Quarterhorse Blanket creates an equine sensation everywhere it goes. Gallop off to a nap or a snuggle wrapped in our 54 x 54 inch Quarter Horse Lap Square -- it keeps you warm and happy in the snooze-time saddle. Truly an heirloom quality Throw that will fill your home corral with the neighing and nickering of outstanding compliments. Fantastic gift for kids and grownups who love riding into a Western sunset! Life's a ride with pride when you wrap yourself in this beautiful, 100% cotton Saddlebred Horse Blanket for a slow trot into relaxation. Best known for high stepping performance in the show ring, this elegant steed is also a stand out on our soft and comfortable Saddlebred Horse Lap Square. Bountiful style and brilliant design mark this stunning Saddlebred Blanket with cherished heirloom quality. Beauty, style and durability will make you give this stunning 54 x 54 inch Throw a prominent place in your home decor. Collect our wide selection of horse blankets for a magnificent display. Saddle up! Everyone loves the sweet, short legged Scottish pony grazing gently on our beautiful Shetland Pony Blanket. So settle in for an afternoon siesta under this cozy Shetland Pony Lap Square and experience the soft, comfortable style. 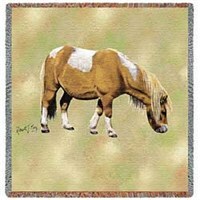 Woven art with keepsake quality, this charming Shetland Pony Blanket will keep you in compliments for years to come. Loved as children's riding ponies, the intelligent Shetland Pony on our beautiful, 100% cotton Throw makes a soft landing spot for horse lovers of any age. Cover a child in love while spinning tales of riding tall in a small saddle. Cuddle up with this hot-blooded stallion and dream of winning the Kentucky Derby with style and panache wrapped in our spirited Thoroughbred Horse Blanket. The heirloom quality and fine artistic design makes this Thoroughbred Blanket a beautiful covering for a bed, couch or hang it proudly as wall art. Made from soft, 100% cotton, this durable and versatile Thoroughbred Horse Lap Square will take as many laps as you can fit under the covers. Measuring approximately 54 x 54 inches, this great Throw celebrates the spirit, speed and agility of the magnificent Thoroughbred. You're off to the races! Nature photograph of a quarter horse foal that is only minutes old, what a miracle. 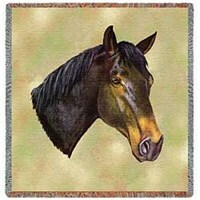 All horse lovers will want this beautiful image on these great blanket throws. Add text to personalize if desired. Sorrel western pleasure quarter horse portrait with southwestern pattern background. Realistic horse artwork created from an original oil painting by wildlife artist Crista Forest. 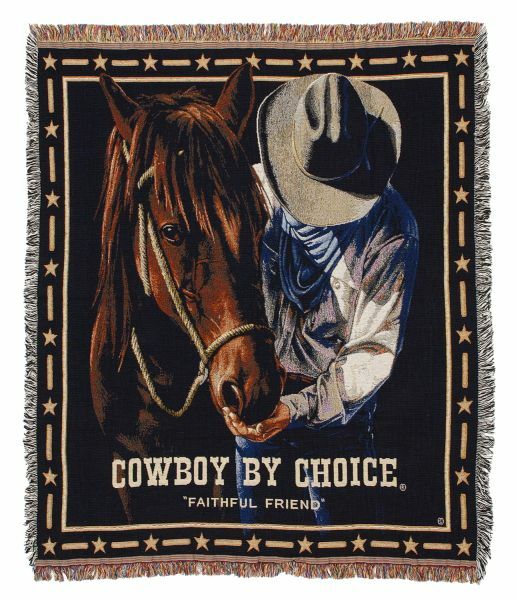 Cotton "Cowboy by Choice Faithful Friend" throw. 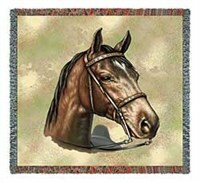 50 x 60.Size:50" x 60"
Reflections Throw50" x 60"Size:50" x 60"
MANY MORE like this at Horse Throw Blankets at Zazzle.